First, we will look at a money word problem involving calculating Simple Interest. Simple Interest word problems are based on the formula for Simple Interest and the formula for Amount. Then, we will look at a money word problem that involves coins and dollar bills. 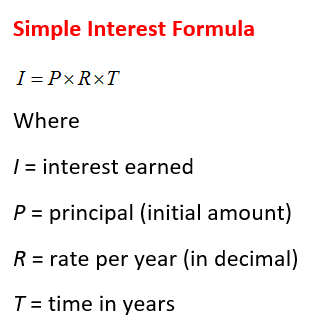 The following diagram gives the Simple Interest Formula. Scroll down the page for more examples and solutions on how to use the Simple Interest Formula to solve simple interest word problems. i represents the interest earned. p represents the principal which is the number of dollars invested. r represents the interest rate per year. t represents the time the money is invested which is generally stated in years or fractions of a year. Pam invested $5000. She earned 14% on part of her investment and 6% on the rest. If she earned a total of $396 in interest for the year, how much did she invest at each rate? Note that this problem requires a chart to organize the information. The chart is based on the interest formula, which states that the amount invested times the rate of interest = interest earned. The chart is then used to set up the equation. Paul has $31.15 from paper route collections. He has 5 more nickels than quarters and 7 fewer dimes than quarters. How many of each coin does Paul have? Paul has 79 quarters, 84 nickels and 72 dimes. Algebra Money Word Problems with two variables (x and y). How to solve equations with two variables? David has only $5 bills and $10 bills in his wallet. If he has 5 bills totaling $35, how many of each does he have? Martin has a total of 19 nickels and dimes worth $1.65. How many of each type of coin does he have? Note that this problem requires a chart to organize the information. The chart is based on the total value formula, which states that the number of coins times the value of each coin = the total value. The chart is then used to set up the equation. How to solve word problems involving coins and money? You have three times as many quarters as dimes and the total amount of money is $6.80. How many quarters and dimes do you have? How to solve algebra word problem involving money? You have 6 times as many quarters as dimes and the total amount of money ia $8.00. How many quarters and dimes do you have? How to solve a coin word problem involving pennies and nickels? A pile of 16 coins consists of pennies and nickels. The total amount of money is 36 cents. How many nickels and pennies do you have? How to solve a word problem involving stamps? You bought 16 stamps consisting of 37-cent stamps and 23-cent stamps. If the total cost of the stamps is $4.10, find the number and types of stamps purchased.